New 122,000-SF home for School of Music serves students, faculty as well as guest artists. 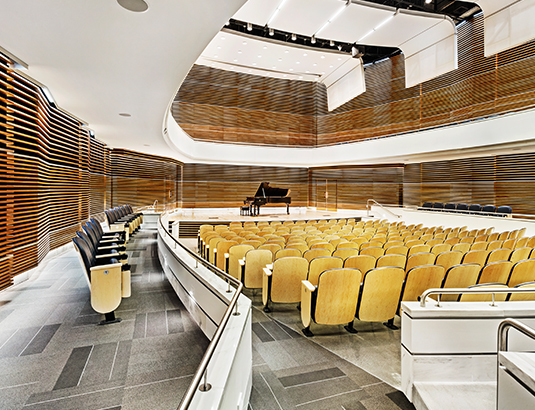 A 400-seat recital hall serves as the facility’s centerpiece and accommodates student / faculty recitals and chamber music performances. Building also includes a full complement of rehearsal rooms, practice rooms, music labs, a recording mixing lab and the 7,000 SF WJ Julian Marching Band Rehearsal Room which accommodates 350 musicians. With an emphasis to provide 21st Century facilities and offer state-of-the art instructional spaces, the building houses 8 technology-enhanced academic classrooms. Additional spaces include performance studios/offices, faculty offices, an administrative office suite and support spaces. The acoustics of the Recital Hall are adjustable to support a wide range of music genres including jazz, acoustic recitals, choral and instrumental chamber music, etc. A limited building footprint presented a challenge of achieving adequate sound isolation between all of the acoustically critical performance, rehearsal and practice spaces. This required the use of box-in-box construction (multiple independent building structures) which assures high levels of sound isolation and enables spaces to be used simultaneously without disrupting each other. All-Steinway Music Education School containing 21st century facilities that provide a world-class atmosphere and environment for artists.